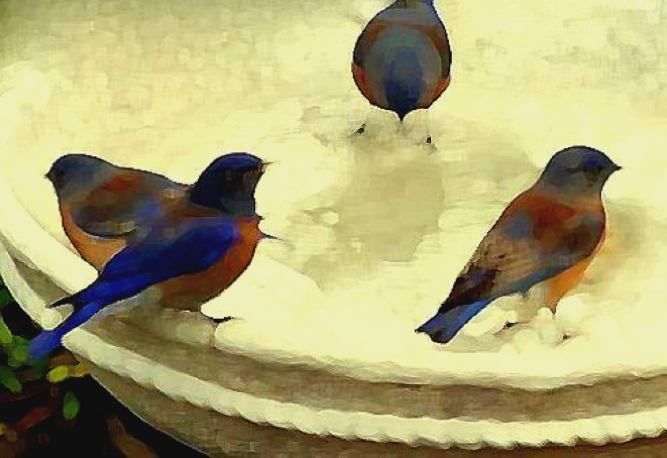 To my delight, I saw six bluebirds at the birdbath in my father-in-law’s garden. I was able to catch a couple of photos and work some drawings. Bluebirds have always been a rare sighting for me but the last few years I have been seeing more of them in Northern California. In recent decades, numbers have declined over much of their range. There is a need to put up many more birdhouses to kept pace with the loss of natural nest sites for these sweet birds. Western Bluebird is a small thrush about 6 to 7 inches length. Adult males are bright blue on top and throat with an orange breast and sides, a brownish patch on back, and a gray belly. They are considerably brighter than the gray-brown, blue-tinged females which I tried to show in my drawings. This thrush nests in holes in trees or nest boxes and often gathers in small flocks to feed on insects or berries. What is interesting is their bills are not the kind to dig out their own holes. They rely on woodpeckers to make their nest sites for them. Western Bluebirds live in open woodlands and at the edges of woods compared to either Eastern Bluebirds or Mountain Bluebirds that are seen more in large meadows. You can find these birds in evergreen and deciduous woods, particularly ponderosa pines but also pinyon pine-juniper, mixed conifers, and aspen. They thrive in disturbed areas such as burned forests or logged areas that still contain dead trees suitable for nesting and perching.